Momentum is fickle, and the Thunder’s grasps at it on Sunday afternoon seemed like trying to snag smoke with bare hands. A swipe this way or that, and suddenly the Thunder was left empty handed. That’s how it went for the Thunder in a 108-104 loss to the Los Angeles Lakers on Sunday afternoon’s matinee at Chesapeake Energy Arena, a game where the Thunder traded the lead and had its chances to break through during the first three quarters and fell behind late in the fourth before the clock ran out on its comeback hopes. Head Coach Billy Donovan and his staff knew that this game had all the warning signs of a massive challenge for the Thunder. The Lakers had won 9-of-13 games heading into this one, while the Thunder has had just one brief road practice since Andre Roberson went out with a season-ending injury. On top of that, there were less than 36 hours for the team to rest in between Friday night’s late game and this early afternoon tilt, with the Thunder already coming off a stretch of five games in seven nights. The Lakers came out hungry, racking up a 12-4 advantage in second chance points thanks to a plus-9 edge in rebounds in the first half alone. It wasn’t those pesky rotational box outs that were a problem, rather it was the sheer physicality and committed nature of the Lakers to dominate that phase of the game with its tenacity and length. Donovan’s club got the rebounding issue back under control in the second half, but the most challenging aspect of tonight’s game was pervasive through the 48 minutes, and has been a recent trend. The Lakers made 13 three-point shots on 30 attempts, good for 43.3 percent and a 18-point difference over the Thunder’s perimeter production. According to Donovan, the problem was one of technique and timing, on a collective level. “I’m really concerned about (the three-point defense) because we have got to have more urgency to run people off the line. We’re not running people off the line. We’re closing out short,” Donovan explained. 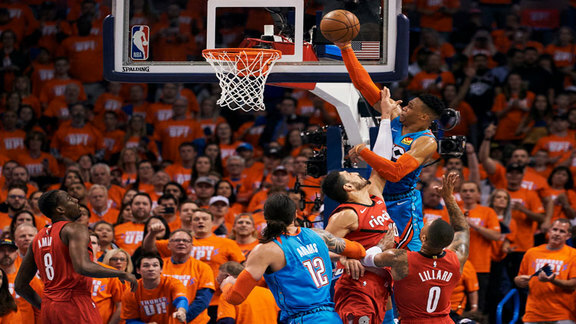 The Thunder hung in there, but every time it generated a momentum play – a monster one-handed dunk by Westbrook or a strong defensive stand, - it couldn’t capitalize on the other end of the floor. Thunder baskets elicited Lakers responses, and either shots didn’t fall or bad offensive possessions ensued following blocks and steals. It was a frustrating game for the Thunder. That showed up in the three technical fouls called against Oklahoma City in the game. They were chasing it all night, and just couldn’t grab it. “We need to do a better job there, calling it like it is, because during the course of 48 minutes there are going to be calls that aren’t going your way,” Donovan said. 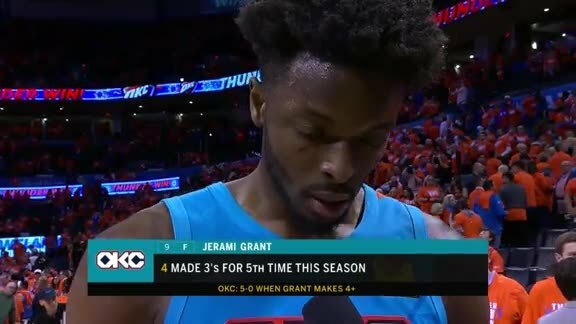 That’s exactly how the game ended, with the Thunder staring down a 10-point deficit with 1:08 to go, then rapidly ripping off seven straight points behind a Westbrook attacking layup, a George steal and slam and then a beautifully executed side-out-of-bounds play to get George freed up at the top of the key on a down screen for a three-pointer. With 26 seconds remaining, Steven Adams thought he forced another turnover but it was overturned by video review. On the next inbound pass, the Thunder had Julius Randle bottled up and pivoting wildly, but instead of a travel or jump ball, it was a foul that was called. Randle sunk one free throw, Westbrook’s three-pointer just missed and the Thunder’s frantic late push grinded to a halting conclusion.